When archivist Stacey Chandler was combing through one of the "Massachusetts" files recently at the John F. Kennedy Presidential Library and Museum in Boston, she stumbled on something unexpected: a letter to Kennedy from an obscure writer named Kurt Vonnegut, volunteering his services on Kennedy's presidential campaign. The letter (click the image above to see it larger) was written on August 4, 1960, when Vonnegut was a struggling fiction writer and a failed Saab dealer living on Cape Cod, in the town of West Barnstable, Massachusetts. He had written two novels: Player Piano (1952) and The Sirens of Titan (1959). In a few declarative sentences, Vonnegut outlines his writing experience and offers his help. 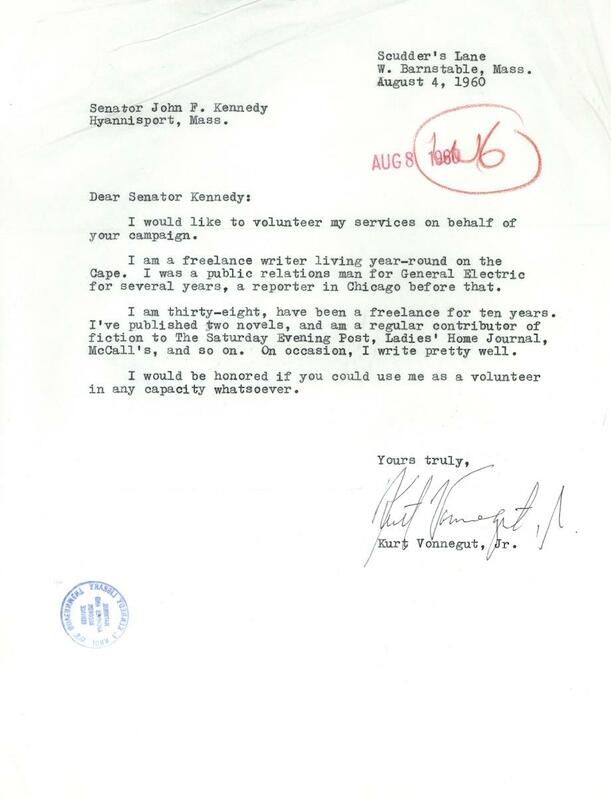 There is no record at the JFK Library of a reply from Kennedy and, according to Rebecca Onion at Slate, no mention of the subject in two Vonnegut biographies. "I am thirty-eight," writes Vonnegut, "have been a freelance for ten years. I've published two novels, and am a regular contributor of fiction to The Saturday Evening Post, Ladies' Home Journal, McCall's, and so on. On occasion, I write pretty well." I agree fully with Ray Stiefvater’s comment. Well done, indeed! The people thank you for your good work!